Yes I know, another race report, I’m used to them being months apart, not weeks. So last weekend it was off to Cadwell Park in Lincolnshire for 3 days including a test day. I’ve only been to Cadwell once and that was in 1994, when myself and some mates, who had also recently passed their bike tests, decided a race school would be fun. All I remember was we did the short circuit, so not really classed as previous track experience. My first impression was how narrow some of the circuit was,I thought I was looking at a service road rather than the track. Once out on the track, it was a great circuit, so was looking forward to the meeting. We had a small oil leak from a worn gasket, which meant I missed one session, but by the end of the day I had started to find a good line around the track and did a best time of 2:02. Saturday was dry and so was looking forward to racing. First race, and I got a reasonable start, but was reeled in before the end of the straight, so settled down to keep with them, which I managed to do. It didn’t help that on one lap I came over the mountain section of the circuit, where the front wheel lifted as it had on previous laps, only this time it didn’t go down again quite as quick. Bit of a shock but did come down in the end. I’ve since learnt that there are two lines over the mountain. The fast line and the good picture line. I’ll stick to the fast line in future. Despite this I got my time down to a 2:00, which was good news. Second race was better and I managed to catch and overtake the guy who had been in front of me in the first race, which was good. But what was better I managed to finish 14 seconds in front of him. After the race I was ushered into the ‘dyno que’. Minitwins are limited to 72bhp and this is checked on BMCRC’s own dyno to keep things legal. Bike passed fine, but I was disappointed to find out that they won’t tell you what power you are putting out. So all I know is that I’m below 72bhp, but how much by I don’t know. I’ve learnt that no two dynos give the same reading, so is very hard to gauge what power a bike is truly making. So the only way would seem to be, by tune the bike a bit, wait until you fail the dyno test, and then detune it, which seems a silly, and expensive way of doing things. Sundays first race was a good one and kept up with the two people in front of me. Once again I couldn’t stay with them on the straights, despite being level with them on the exit of the last corner. But by the first corner I was back up with them, and by the time we got to the last section I felt I was being held up by them. John who was helping me this weekend said the same as Steve and James before him, come the straights and the others clear off. So a bit of research has been done since I got home and I’ve found I have been way off with my gearing. The bike seemed to be revving fine, but the gearing I’ve found would certainly give me more acceleration, which is what I seem to be lacking, so will be trying this for when I’m out next. Even though I had the wrong gearing I still managed to get my time down to a 1:58 in the first race and a 1:57 in the second, so at least I’m improving. As well as getting faster, I’m also leaning over more as this picture shows. 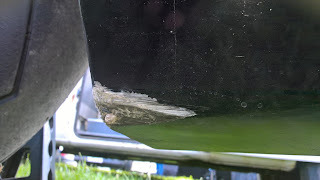 Yes I’ve ground a hole in the fairing, which is good as it allows the stones I collect to drop out, but sadly would also allow oil out should there be any in there. I will of course be fixing this before I go out next. All in all Cadwell was a good weekend with some positives, and a great track, which I can’t wait to race at again. I was so excited to see the differences in what gearing I have been running to what others are, it has given me hope that with that simple fix I would like think I will be a bit further up the field, and it is the bike not working correctly and not just me being slow, but only time will tell. Luckily it’s not long until I’m out again, this time at Silverstone at the end of the month, and yes I have seen a gearing I will be using this time.